We are situated off the main Dublin-Rosslare road, M/N11, between WICKLOW & ARKLOW. Input Ballymurrin Quaker Farmstead, Kilbride, Co Wicklow, Ireland onto Google Maps. Eircode A67 PX56. EXIT 18 for Wicklow/Redcross. Straight through two roundabouts, passing in FRONT of the Beehive pub. Take left hand turn 600 metres beyond, (kilbride is signed). Follow twists and turns in road for one mile. You will see a sign pointing right, down a gravel lane. 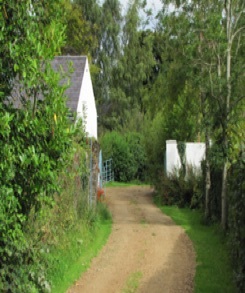 Follow lane to end, through two white piers and into the courtyard of a pink house with white outbuildings. There is normally ample parking. Note: If you travel as far as the Quaker Burial Ground, you are close, but need to turn back and take first lane on left, and follow instructions above. TRAVELLING NORTH M11: Take EXIT 18, and take 3rd exit at rbt over the bridge. At rbt, take 3rd exit and follow instructions from Beehive pub, as above. Advance notice assists us to enhance your experience and is essential outside selected dates. By Bus:Dublin/Gorey Wexford Bus 740A. Ask for Ballincor Stop. Phone in advance, & if we can, we will collect you. By Rail: Europort train runs between Dublin and Rosslare. Check the timetable. Alight in Wicklow. Taxis available.